I certify that the work I will submit is an original composition and that the above is true and accurate to the best of my knowledge. After you have submitted your application, we will review it to ensure it meets the eligibility requirements, which may take up to two business days. If the eligibility requirements are satisfied, we will send you an email invitation to Box, an online storage tool where you will need to upload the remaining required submission documents by February 22, 2019 (no late submissions will be accepted). MP3 – The recorded version of your score must be submitted in MP3 format (it is up to you to decide what quality of MP3 you wish to submit). Both MIDI and live recordings are acceptable. Either 1 or 2 tracks may be submitted, but the total length of the entire submission should not exceed 5 minutes. If you choose to submit 2 tracks, they can either be from separate works or 2 excerpts from a single concert work. Written Score – Your corresponding written score(s) must be submitted as a PDF. Cover Letter/Essay – Include a cover letter/essay about yourself and your work. It should include brief biographical information, your academic and career objectives, why you feel this scholarship would be beneficial in helping you accomplish these objectives, and explain the context of the work you are submitting (e.g. What is the scene? Is it for film, TV, video game? Etc.). The cover letter/essay should not exceed 500 words. Students are advised to submit what they think is their best work, and what demonstrates their approach to film music. Works submitted should be original compositions that have never been published before or awarded a prize in another competition. 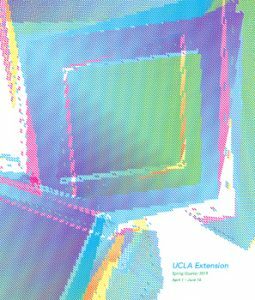 Scholarship recipients must apply scholarship funds toward enrollment in coursework in the UCLA Extension Film Scoring Certificate within the four quarters following the award receipt. Any funds unused within the prescribed 12-month period are deemed invalid and revert back to the BMI/Jerry Goldsmith Scholarship Fund. For more information, please contact UCLA Extension Entertainment Studies at (310) 825-9064, or email BMI/Jerry Goldsmith Film Scoring Scholarship.